Singapore's largest employer, the Government, is going beyond the National Wages Council's (NWC) recommendations and leading the way in boosting the pay of lower-wage workers. It is giving Division IV employees, like storekeepers, an additional pay increase of $70 next month, on top of their annual increment. This surpasses the NWC's call last Friday for a built-in wage increase of at least $60 for workers earning a maximum of $1,000 a month. Combining the extra $70 with their typical annual pay rise of $30, these civil servants will get $100 more, or three times their usual salary hike. They currently earn between $1,135 and $1,400 a month. Their pay hike was announced yesterday by the Public Service Division (PSD), which also said a mid-year bonus of 0.4 month will be given next month to about 80,000 civil servants. This is a tad higher than last year's 0.3 month of their salary. The National Trades Union Congress welcomed the Government's gift to the 3,600 workers on its lowest rung. It is heartened by the Government's support of its proposal for a higher dollar quantum to help low-wage workers, said its assistant secretary-general, Ms Cham Hui Fong. Division III civil servants, who typically do clerical work or frontline duty serving the public, are also getting something more. Their built-in wage increase is $40, on top of their annual increment of $50. In all, their $90 pay rise will be 1.8 times their usual increment. So, from next month, their salary will range between $1,320 and $2,070. As for the Division IV officers, the new range is between $1,205 and $1,470. The PSD said it will continue to work closely with the Amalgamated Union of Public Employees to review the salaries of its lower-wage workers, taking into account the need to upgrade the value of jobs and provide for meaningful career advancement. "This signals the Government's continued commitment to help raise the salaries of lower-wage civil servants," it added. Unions cheered the increases, with the general secretary of the Amalgamated Union of Public Daily Rated Workers, Mr G. Muthukumarasamy, saying the built-in wage increases will help workers with their expenses amid rising living costs. Mr Alias Mohd Jani, a Division IV operations support officer in the Education Ministry who earns about $1,400 monthly, agrees. The 65-year-old said: "I spend almost all my monthly pay and can't save, so this rise will help a lot." The PSD, in its statement, noted that this year's payout is made against a backdrop of a global economy that is expected to improve gradually. 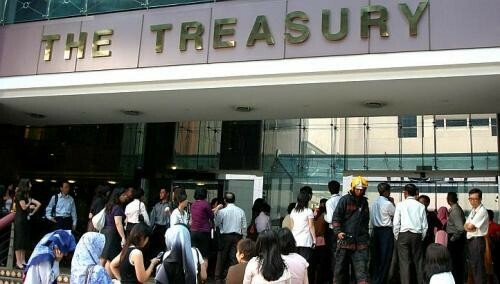 But risks remain, it said, adding that Singapore's overall unemployment rate stayed low in March, at 1.9 per cent. The NTUC said the bonus amount was reached after close consultations with its representatives and officials of civil service unions. Ms Cham said the mid-year payment "fairly rewards civil servants for their dedication and contributions to the workforce and economy", despite the economy's subdued expansion. It grew by 0.2 per cent in the first quarter of this year, compared to 3.3 per cent in the preceding three months. The PSD said the year-end variable bonus for civil servants will be decided by how well the economy performs in the second half of the year. For the whole of this year, the Government forecasts growth to be between 1 and 3 per cent. Last year, when growth was 1.3 per cent, civil servants got a year-end variable bonus of 0.7 month.